The art of taxation consists of plucking the goose so as to obtain the largest amount of feathers with the least possible amount of hissing. Taxation comes in a variety of forms. A company pays taxes in its own country, in the country where it has concessions, and in other ways. The subject is extremely complex, and here we mention only the most common aspects of taxation in a host country. The total of all the taxes and royalties is often referred to as the "Government take". The great variety of levels of world-wide government take is shown below. 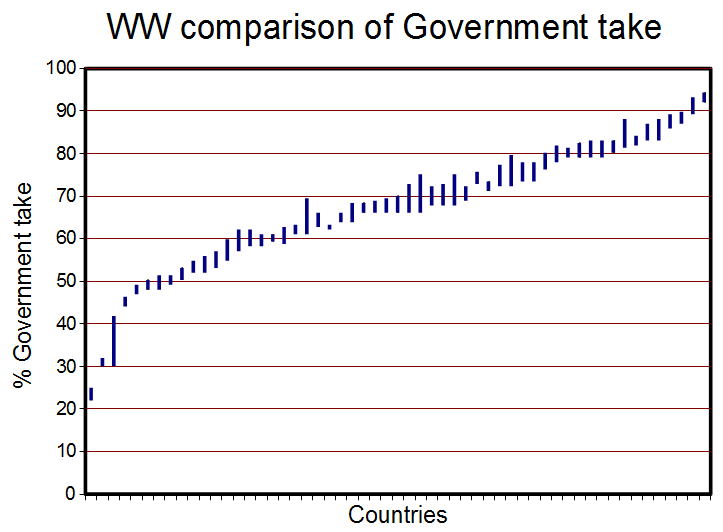 For a recent overview of Gov't take see the paper by GOA, 2007. In the following list a number of the most common forms of taxation and arrangements are mentioned, but not all occur or are applicable to all petroleum contracts. Concession rentals are annual payments to the host government for the right to explore or produce in a given concession. The fees depend on the perceived prospectivity of the acreage. In 1933, the prospectivity of a 1.3 million square kilometer concession in Saoudi Arabia was not regarded as very high by the King. So the annual rental was only 5000 British Pounds! Not surprising that things have changed since then. A "taxable field" is defined in FA93\S185(1) as a field which is not a non-taxable field. Profit tax can come under various names, such as the PRT above, or in the USA as "Windfall Profit tax". Many of these constructs are the fruits of high oil prices coupled to the publics indignation about the huge profits that the oil comapnies make. They are to a certain extent ad hoc solutions to remedy an inbalance between companies'and Government income and may be abolished again when oil prices are low, so as not to discourage investment. Corporate tax is paid to the host company after aggregating all profits and losses from individual projects a company may be involved with in the host country. Special taxes then have already been paid on e.g. ring fenced fields. Corporate taxes vary from country to country between 10 and 40% with a mean of some 25%. In the UK offshore several taxes are levied. The Petroleum Revenue tax is a field-based tax. A field may make profits or losses. To avoid that losses on one field may be offset against profits of another field, a "ring fence" is placed around each field. As companies borrow money for the field development, the interest paid is deductable. Because of the ring fence it is only deductable within the ring fence. State participation can be a percentage offered by a company to the host government in the bidding process, but it can also be a fixed percentage stipulated in the mining law. The state participation usually only begins after oil or gas has been discovered. The foreign company carries all the exploration risk. In times of high oil prices, Governments tend to maximize their income, not only by bidding rounds, but also stipulating that upon signing a contract for an exploration permit, a bonus is payable. A signature bonus can also be relevant to a development contract. Recently a US$ 500 million signature bonus was paid by BP and CPNC to the Iraq Host Gov't. for developing the Rumaila field. In such a case, it is likely that profits will outweigh these front end costs, despite political uncertainty. In the case of a production licence, sometimes a production bonus is required by the government in advance, say a US$ 10 million when production exceeds 50,000 b/d. In other cases (Egypt) a production bonus is a bidding mechanism, based on reaching a certain amount of cumulative production. The company that promises the largest bonus is then in a good position to have the licence granted. Governments often organize leasing rounds where companies can bid for acreage. Sealed bidding has been important in areas like the UK North Sea, the Gulf Coast of the USA and Brazil. The latter is nicely described by Rodriguez et al. (2009). Bidding can be based on the highest cash bonus, but other systems involve royalty bidding. Sometimes enormous cash bonuses are paid to explore an acreage block that eventually is not successful. So, in 1973,in a lease sale involving 6 tracts on the Destin Dome, a consortium of Mobile, Exxon and Champlin left some 630 Million $ on the table. Although the structure was one of the largest ever seen in this area the results were quite disappointing. Although not strictly a tax, the bonuses paid can be an attractive income for the government. For the companies it is a less attractive "front end loading" of expenses that is has the highest impact on present value of the lease.